Can the China boom last? Whether it’s milk or beef, grain or infant formula, middle class China can’t get enough of Australian produce. The perception is that our goods are safe and natural - and experts say we have another five years before the wild ride slows. FARMERS are constantly told about the opportunities for exporting beef to China – and for good reason. China is now Australia’s fourth-largest beef export market, behind Japan, the United States and Korea. But it’s not just beef China wants. Dairy products, citrus, infant formula, cherries, grapes and wine are just some of the other products jumping on the China export bandwagon, while commodities such as wool, wheat, barley and sorghum are also sought-after. So why does China want Australia’s products? With a population of about 1.4 billion, China has emerged as the world’s largest consumer market for food and beverage. It is also one of the fastest-growing food and beverage markets in Asia, with an average annual growth rate of 35.4% from 2011 to 2014, according to a recent study conducted by Euromonitor. With a burgeoning middle class, the Chinese economy is becoming more consumption-driven, due to continuing urbanisation and rising disposable incomes. According to BMI Research, 12.2 million Chinese households earn at least US$35,000 (about $45,000) a year disposable income, with that number expected to increase by 74% to 21.2 million households by 2021. Meanwhile, the China Australia Free Trade Agreement, which came into effect in December 2015, has significantly reduced tariffs across a range of commodities and products, giving Australia a competitive advantage. Sara Cheng, senior manager of China practice at the NSW Business Chamber, says China has enjoyed fast economic growth over the past three decades. It also experienced a 15% rise in its food market last year. “In the past five years, China’s Gross Domestic Product has grown 8% on average, which is three times more than other countries,” Sara says. She says Chinese consumers want Australian beef, seafood, dairy products, fruit, honey, dried fruit and even edible oil and chocolate. That’s where beef comes in. Australia’s beef exports to China rose sharply from almost nothing to 32,906 tonnes in 2012, then peaked at 154,833 tonnes in 2013, before levelling out to 110,059 tonnes in 2017. Last year, 95% of the beef Australia exported was frozen, with the growing chilled beef market making up 6,045 tonnes. Grass-fed beef was also the preferred option, making up 76% of the total, compared to 24% grain-fed. Angus Gidley-Baird, senior analyst, animal proteins at Rabobank, says the outlook for beef to China is positive.“China will need an additional 800,000 tonnes of beef by 2020 and demand is expected to outpace domestic production,” he says. 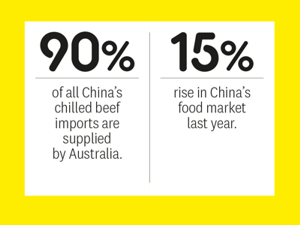 Chinese beef imports are expected to make up 20% of the total supply. Angus says that Australia’s other export markets are “fairly stable”, so any growth in beef production is likely to be absorbed by China. While Australia was one of the first countries approved to supply beef to China, more countries have been given access in recent times, including the US, New Zealand, Argentina and Brazil. “China is a very big market and our value is differentiating ourselves from those other countries,” says Angus. The latest China market snapshot by Meat & Livestock Australia (MLA) says that Australia is well placed to meet growing demand for chilled beef into China. Australia supplies 90% of all China’s chilled beef imports and, over the past 10 years, exports have increased 16-fold from 375 tonnes in 2007 to the 6,045 tonnes last year. Kenny’s Creek Angus stud cattle, in Booroowa South East NSW epitomises this clean green market, providing Chinese customers with high quality, hormone-free, grass- and grain-fed beef. Further details below. Photo supplied by KC Angus. A MLA spokesman says chilled beef is a relatively new concept for Chinese consumers, but demand is expected to grow and could potentially make up more than 50% of the market by 2027, due to cold-chain development and increasing disposable incomes. Data gathered by MLA shows that when average Chinese consumers purchase meat, their most important considerations are freshness, use-by date, additive/hormone-free, meat colour, 100% natural and price, followed by country of origin and brand. However, these priorities change when they can afford premium and imported meat products. Live exports are still a small portion of the total market to China, with 1,200 live cattle exported for processing, as well as 11,883 beef breeders, transported in 2016-17. Angus Gidley-Baird says all signs are pointing toward a growing market, with shipments out of Townsville and Darwin already this year. The Australian Trade and Investment Commission (Austrade) states food consumption patterns in China have changed significantly as living standards have risen and more consumers are exposed to a greater diversity of choice, locally and through travel abroad. David Jamieson, trade manager for food and agribusiness at Austrade, says China is Australia’s largest export market for food and agribusiness products. However, he adds that China wants a “fairly narrow band of products and commodities” and the opportunity for Australia exporting to China is to add value. David lists items such as vitamins and nutritional products, infant formula, wine, chilled beef, dairy products and seafood as among the most popular higher-valued Chinese imports. Fruitful horizons: Ross Hill Winery, Orange NSW is experiencing prosperous growth in the Chinese market. Further details below. Photo by Pip Farquharson. Wine is one of Australia’s exporting highlights, experiencing huge growth into China. Wine Australia’s general manager of market insights Peter Bailey says China is one of the world’s fastest-growing and largest wine importers, with the expanding middle class opening up opportunities. He says the value of Australia’s wine exports to China grew 63% to $848 million in 2017 and volume increased by 54%. “It’s been extraordinary growth, from $100 million worth of wine to China in 2008 to almost $1 billion in 2017,” Peter says, adding that the driver is the perception of Australian products as high quality, healthy and authentic. Despite all of the new export market growth for Australian products, wool continues to be one of the strongest agricultural commodities. National Council of Wool Selling Brokers of Australia executive director Chris Wilcox says China has been the most important wool export market for Australia since 2000. China has purchased more than 70% of the Australian Merino wool clip since 2008, taking 78% of the total volume in 2016-17. “It’s a great marriage between two countries – one being the biggest Merino wool producer and the other the biggest wool processor,” Chris says. While he sees no sign of a change in the volume of wool exported to China, he says there are risks with labour costs increasing in China. Meanwhile, horticulture products have become a new favourite with Chinese consumers. Horticulture Innovation Australia general manager of trade, Michael Rogers, says China is interested in all Australian fruit, vegetables and nuts. Table grapes, cherries, summer fruits and citrus are currently exported to China, with a Chinese tradition of gifting fruit to friends and family helping to drive demand. “There is a strong emotional connection between Australia and China, and consumers want that connection with the Australian lifestyle,” Michael says. National Farmers’ Federation president Fiona Simson says there is still opportunity to be had in China for bulk commodities and processed goods or niche products. The size of the market and proximity to Australia makes it an incredibly attractive destination,” Fiona says. Fiona says Australian producers and exporters still have a lot to learn about doing business in China. NSW Farmers’ general manager, research and innovation David Eyre says Australia’s proximity to Asian markets, our free trade agreements and strong reputation for food safety and quality present exceptional opportunities for paddock-to-plate marketing. “Global demand for source-verified fresh, healthy and personalised food segments is projected to reach $8 trillion per annum by 2025, with the majority of new demand arising in Asia,” he says. David and a group of NSW Farmers members recently visited China as part of the Direct Beef Export to China project, which focuses on investigating the potential for direct, provenance-based marketing of small volumes of premium branded beef, consumer-packed in Australia and sold on ecommerce platforms such as TMall Fresh. Sam Burton Taylor saw an opportunity to export beef to China and took it. Sam is the founder and managing director of Kenny’s Creek Natural, a beef company based in Boorowa, South East NSW, that provides “high quality, hormone-free, grass- and grain-fed beef” for domestic and export markets. It’s been an interesting path for Sam, from growing up on his family’s Kenny’s Creek Angus stud, to a finance career in Sydney, to buying the Boorowa butcher shop and doing his apprenticeship, then selling the shop to focus on supplying beef to export markets. “In 2012-13 China’s beef imports grew by three-and-a-half times and I saw an opportunity for us,” Sam says. He shipped his first container of frozen beef to China in 2014, just months after making his first fact-finding trip to the country. “We were trying to grow the wholesale, retail and online beef market in Australia and while it was successful, we didn’t get the growth we wanted, so we looked at China,” Sam says. Sam says his company focuses on selling grass- and grain-fed Angus beef sourced from its own farms and clients of the Kenny’s Creek stud. While doing business in China isn’t without its challenges, Sam says for him, visiting the country and finding people he could work with was key. Taking the time to develop marketing and packaging that is suitable for Chinese consumers, and using Chinese social media platforms is also powerful. Putting Orange on the world map: James and Chrissy Robson at one of their Ross Hill vineyards with their kelpie Jerry. It wasn’t so long ago that innovative marketing for a vineyard was opening a cellar door and serving gourmet lunch. All that has changed and, this June, nine vineyards from the Orange region are banding together to join Wine Australia’s China Roadshow 2018, which aims to help producers drive awareness and increase export sales of Australian wine, with a focus on extending Chinese distributor networks. Brand Orange, an independent non-profit organisation, is working to promote the Orange region in Central West NSW as a gourmet food and wine destination. James Robson, owner of Ross Hill Wines, a carbon neutral winery situated in the hilltops of Orange, with vineyards located 600m to 1,100m above sea level, says: “The next step for the Orange region is to go overseas and we see China as a big part of that. Australia is seen as a prestige food and wine country and that’s the way we need to market to them. Since becoming carbon neutral in 2015, Ross Hill Wines has boosted domestic sales by 20%, with a 30% increase in direct customers. Exporting fresh milk and ice cream to China is a long-term approach for Australian farmer-owned dairy cooperative Norco. The Lismore-based business on the NSW North Coast has been exporting fresh milk to China for almost four years, and was the first to successfully do so, helping to pioneer the export protocol. Norco now also exports ice cream to China. While its domestic market for fresh milk and ice cream is still larger than its exports to China, Norco’s international business development manager Craig Burgess says the exports contribute to overall operations and profit, and volume of product. MILKING the luxury market: Norco’s fresh milk sells for up to $10 a litre in Chinese supermarkets. On supermarket shelves in China within seven days of being produced in Australia, Norco’s fresh milk sells for up to $10 a litre. Craig says fresh milk is sold as a luxury product and, with the middle class growing every year, so is the opportunity to sell more products. “Ice cream is well received around the world and even if consumers aren’t milk drinkers, they still like ice cream.” He warns that quality control is critical for success, and Chinese procedures must be carefully followed. “There is still a great opportunity in China, but it is a long-term proposition and it has to be carefully managed,” he says. Craig also believes that there is an opportunity for Australian products throughout Asia. “The rest of Asia is within an eight-hour plane trip and there are huge populations.